Anyone who claims that beauty is “effortless” is lying. It is not and I’m not even bothering with false lashes, hair extensions or perfect manicures twice a week! I was sat at the hairdressers (AVEDA, of course) and started thinking about all the trinkets and tools that we actually use on a daily or weekly basis to achieve our looks. 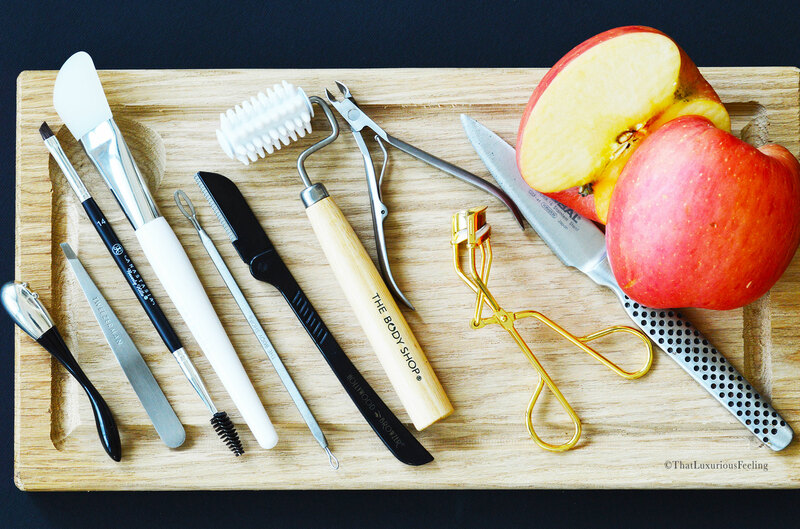 Never mind the regular flannels, hairbrushes, flatiron, curlers and makeup brushes circulating my vanity; I thought about all those other small gadgets I’ve accumulated over the years and now find myself using everyday. Natura Bissē: the cooling massage tool is designed to be used around the sensitive eye area for lymphatic drainage massage and de-puffing relaxation for the skin. 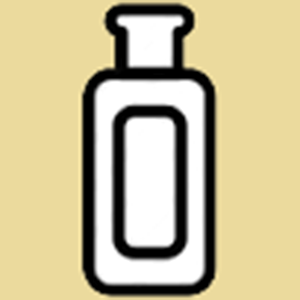 It is quite heavy and makes my nighttime skincare routine extra comfortable and calming. I do own a similar tool made by La Mer and alternates between the two of the. Tweezerman: I believe it’s impossible to live without a great pair of tweezers and this is a whole science, I’ll tell you! 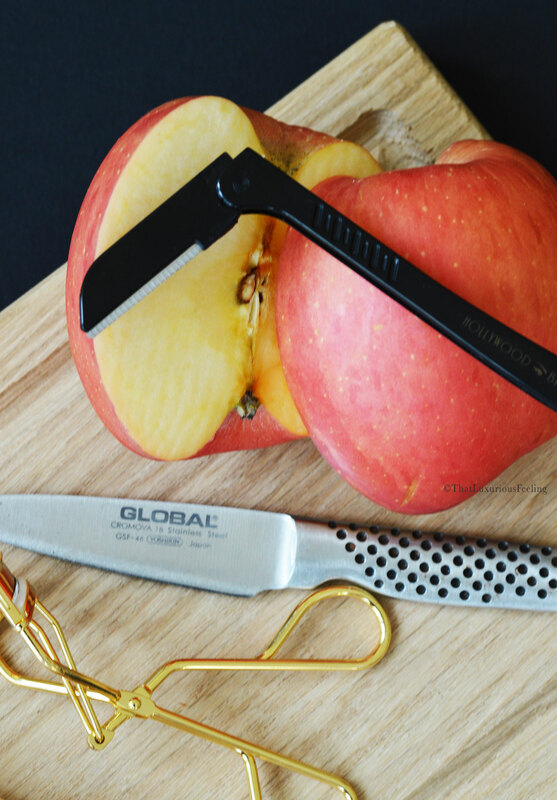 The Slant Tweezer is hand polished into a perfect 25-degree angle for the correct grip and clean tweezing. Getting hold of a sharp tweezer is important if you want your job to be precise, not to bleed and make any dents in the skin. AnastasiaBeverlyHills: no other brand perfects painted eyebrows like ABH and I can’t get my horrible brows in order without the assistance of their #14 and #12 angled brushes with small spoolies. There are no other brow-brushes so incredibly fine, yet dense to work with. It is not even a challenge to draw on fine hairs with these and get a very natural results. If I can do it, you can do it! Sephora: silicone spatula. Hello multi-masking personality! I love to mask, the more the better and I would never apply my products with fingers. It is too messy and I need the layers to be even and smooth. This little tool is easy to clean, hygienic and affordable (a own multiple) and works wonders with any charcoal mask you might have issues with. I also find it to be such a reliable tool when applying any products onto someone else’s face if I try to give them a facial. The Body Shop: this little dual-ended tool for safe extractions is a little bit of hate-love for me. I use it to make sure I avoid using my nails anywhere near a congested pore but I still feel like it gives a little bit of a mark on the skin. It is best to use on top of a paper tissue for damage control. Hollywood Browzer: this little baby is what I initially wanted to discuss! Let me present the rest of my tools and return to this one in a second. The Body Shop: DermaRoller. I know, it looks completely silly but the truth is that your skin needs blood circulation to function and be healthy. As we lay still at night or sit up straight at our computers, the blood in our head is not really circulating as you might wish. I love this little fun massage-tool as it is easy to travel with, I can use it in the sofa in front of the tv at night and it is really relaxing for my clenched jaws. It is a good tool to use to prevent headache. LifePharmacy: I confess, I own three of these because I’m slightly obsessed with clean nails and cuticles. Even though I’m the worst at painting my own nails, I need to have them in order. Chipped nails or ragged cuticles gives me the chills. Shu Uemura: eyelash curler. Ever since we could see Gisele Bündchen’s character Serena (Devil wears Prada) make fun of anyone who doesn’t know what this is…we all knew we had to be onboard. The Tokyo atelier of premium tools makes the best eyelash curlers on this planet; you will never risk breaking your lashes with these and they will give your lashes a natural lift that holds for hours and hours. Now, back to the Hollywood Browzer. For the last couple of months or so, I’ve seen multiple alternatives to these tools circulate on social media. I will not try and “sell” you mine by saying anything negative about another brand – what ever works best for you and is easy accessible is what you should be using! First, let me tell you a cute little story: before christmas I happen to see the Hollywood Browzer featured over at my friend Heidi’s Instagram feed. The very best thing about our global beauty community is that we quickly learn whom to “trust” and take your recommendations from. When I saw her using this tool I left a positive comment about how I really wanted to try something similar and she contacted the owner of the company, Amy, who kindly wrote me an email! The world is quite small and as it turned out, Amy was coming to Dubai for a business trip and asked me if I could meet with her to get a chance of trying her tool. I was super intrigued as I knew that the company was based in The U.K and I had no idea how to get the tool to Dubai all on my own. Amy and I met over a lunch that turned into an evening date. I can’t remember the last time I’ve found myself chatting away so casually and easily with someone I’ve just met. I fell in love with the tool because I fell for the woman and her authentic and professional approach. For all my Asian readers I know that these beauty tools have been available on the Asian market for years and years. For us western shoppers and for Middle East, it is quite new and the quality differs! For me personally, I don’t have any eyebrows to tame (they are super thin to begin with) and I’m not suffering from a dark top lip or chin hair. However, I do have quite a lot of facial hair on my side burns, down under my ears and even on my cheek. I would never say that this is bad looking or ugly, not at all, but for me it has been a bit tricky to apply foundation as it gets caught in every little strand and makes the result uneven and dark looking. I’ve never used a lady shaver to shave my face; it has always felt very risky and I’ve been scared to cut myself or even see ingrown hairs as a result! My skin is super sensitive and I’ve not find it in my budget to invest in a course of laser. Waxing is not my thing at all and then ever I’ve tried threading, I’ve always ended up with a reaction in my hair follicles. There is a common myth out there who says that if you shave off a strand, it will only grow back thicker. This is false. 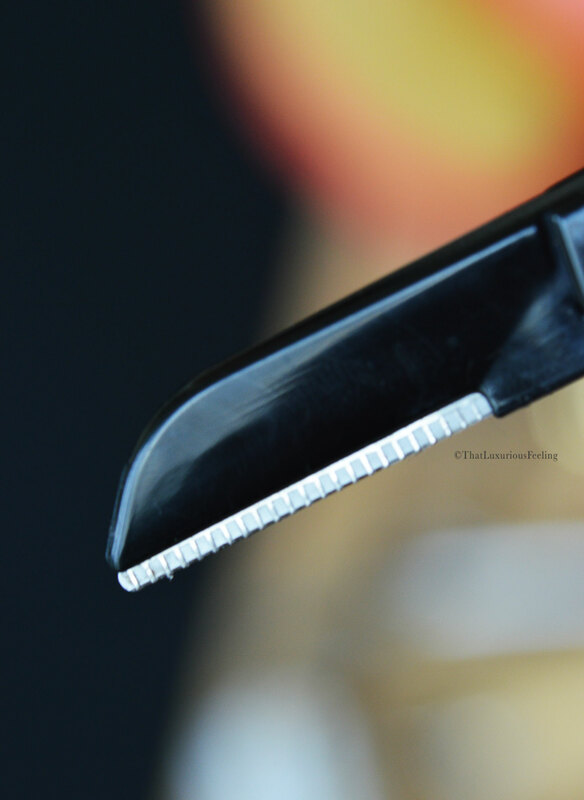 The angle of the cut may make the strand feel more dense but the thickness of a stand can only be alternated inside the hair follicle found in the dermis. When using a small blade like on the Hollywood Browzer, you are nowhere near the follicle of your strand. There are two things I especially like with the design of this beauty tool: first of all, it is foldable. It comes with a small velvet pouch and you always fold it in when it’s not in use. The blade will stay sharp and you won’t risk ruining your makeup bag of handbag. The second thing it the unique design of the blade. It is a stainless steel-coated blade and if you look very closely at it, it is guarded on each side with a ruffled edge. It makes it impossible your you to risk cutting yourself and I’ve really put that to the test by trying to cut my finger! Hahaha, I’ll do anything for you guys. One kit of the Hollywood Browzer contains two tools and one protective pouch. One blade should easily last you up to 3 months, making it a very cost efficient and safe way to get rid of the “peachfuss”. One thing that Amy told me, that I had not even considered was the exfoliating properties of a blade this size. I always use either chemical or physical exfoliation and I consider it really important in order to achieve healthy looking skin. On the parts of my face where I do get my hair, I also get some small congestions and even pigmentations. It makes the area look even darker and harder to “cover up” with makeup. Since using the beauty tool, not only is my hair gone; I don’t get any nasty re-growth and I have had the chance it “exfoliating” all dead skin cells (very visible when you wipe of the blade with a paper tissue, yuk!) so that my skin can breath and heal. I’ve not experienced any clogged pores or ingrown hairs, no redness or irritation and my base makeup works so much better with my skin. As it so happens, I know that the tool will soon be available here in Dubai in a store I love. I think it will be incredibly welcomed in this market as a lot of us living in the Middle East tend to have darker hair and more of it than in other places. The Middle East is also all about fabulous and perfect eyebrows – it is a huge business over here and I’m sure that this little blade will come in handy for those who wish to keep their brows in shape. Hollywood Browzer provided for review consideration. All other products are private purchases.